FABB attended the Reston Metro station workshop last night. The purpose of the meeting was to solicit feedback from the community regarding their goals for providing access to the planned Metro stations at Wiehle Ave and Reston Parkway. The group was divided into 7 smaller groups who discussed their 2-4 main goals and reported back to the larger group. Almost without exception the groups stated they wanted safe, convenient access for bicyclists and pedestrians as a top goal. It was stressed in some of the groups that in areas where there is expected to be high densities of pedestrians and bicyclists, it's best that they be separated. If not separated, the access routes need to be wide enough to accommodate both. Preferably there would be on-road facilities for most bicyclists and wide walking paths for pedestrians and the disabled. Intersections need to be changed to allow for safer crossings for pedestrians. Road travel lanes should be narrowed to allow for creation of on-road bike lanes and wide curb lanes. Other top goals included a frequent, direct, feeder bus system. The RIBS bus system must be changed to focus on station access. Parking concerns were also discussed since there will be no motor vehicle parking at the Reston Parkway station. There will be over 100 parking spaces for bicycles at both station. These need to be well-lighted, covered, secure, and close to the station entrances. FABB hopes to meet with the transportation consultant, Vanasse Hangen Brustlin, to provide feedback on preliminary bike/ped access plans. Many people mentioned an article in the Saturday Post about a Paris bike rental scheme in which thousands of bicycles will be placed in special racks throughout the city. There is a refundable deposit (about $200), yearly membership fee (about $40), and hourly rental rates. The best part of the system is that the first half hour is free. 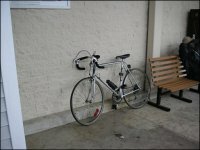 Most local trips take less than that, so frequent users who travel short distances pay very little for use of the bikes. The bikes are locked and can only be used with a credit card. But there is a practical side, too, Dumesnil said. A recent study analyzed different trips in the city "with a car, bike, taxi and walking, and the bikes were always the fastest." The Paris plan is based on a very successful bike rental system in Lyon, France. Densities in Fairfax may not be high enough to support such a system now, but soon the Tysons Corner area will reach urban densities and rental bikes like those in France could possibly work there. To ensure good bicycle access to the future Wiehle Ave. and Reston Parkway Metro stations, cyclists are encouraged to attend a public outreach meeting on station access on March 27, 2007 from 7:00-10:00 p.m. at Hughes Middle School in Reston. For background see the earlier FABB blog entry on the station access group. For details about the meeting see the Reston Metro Access Group website. In 2004 VDOT developed a new policy for integrating bicycle and pedestrian accommodations. It's a good policy but it wasn't being implemented. The Secretary of Transportation asked VDOT to figure out how to ensure that the policy would be implemented in the future. A task force was formed and the result was a new set of policies outlined in a January 23, 2007 letter sent by Richard L. Walton, Chief of Policy, Planning and the Environment, VDOT outlining the new policies. The biggest win for cyclists is the “goal of spending 2 percent of the paving budget in each VDOT Construction District to provide paved shoulders.” To read the letter and the other documents associated with the new polices, visit the VDOT website. Thanks to WABA, FABB was able to attend the National Bike Summit organized by the League of American Bicyclists, that started today in DC. Congressman Earl Blumenauer, a longtime friend of bicyclists in Congress, wearing a pants clip, evidence that he biked over from the House, gave an inspirational talk on the prospects for bicycle facilities in the new Congress. With Minnesota Congressman James Oberstar as chair of the House Transportation and Infrastructure Committee, the potential for Federal funding for bicycle facilities couldn't be better. If you haven't done so already, contact your Congressional representative and ask them to support the Bike Commuter Act and the funding for the Conserve by Bicycling Program. Bike Summit attendees will be lobbying Congress tomorrow for these and other initiatives. This year there will be two new Fairfax Bike to Work Day sites. Bike to Work Day will be held on Friday, May 18, 2007. The Booz Allen Hamilton entrance is the site of the Tysons Corner pit stop. Booz Allen sponsored a pit stop last year but there was very little publicity as it was not an “official” stop. Most people don't consider Tysons to be a bikeable place. It is obviously a very congested location, but mainly along Route 7 and Route 123. There are however many bike routes into Tysons, and you can find many of them on the FABB draft bike route map. The Franconia-Springfield Metrorail Station is the location of the Springfield pit stop, the other new site this year. Thanks to Fairfax County staff for helping make this happen. A pit stop in the south part of the county is a welcome addition to the Fairfax pit stops. s website to register for Bike to Work Day. Select a Pit Stop location and fill out the online form. If you regiser by May 11 you will receive a free t-shirt. At the pit stops you get a free breakfast, bike-related info, a chance to win raffle prizes, and you support a clean, healthy, low-cost commuting alternative. In June 2006 the supports for the bridge over the Piney Branch on the W&OD Trail were washed out. The regional park authority (NVRPA) determined that the bridge was not safe and they blocked off the trail at that point. Shortly thereafter a detour bridge was constructed. The detour consists of a crushed gravel trail leading to a narrow, metal bridge adjacent to the old bridge. The trail can be hazardous, as the gravel is very loose in some parts where it was repaired after another storm. NVRPA is now saying that construction will begin in a few weeks and is expected to last for 3-4 months. We'll be lucky if it's open by the end of summer. For more info on the repairs contact NVRPA at wod@nvrpa.org. It would be nice if their website contained information about the status of the detour, as well as info about future construction projects like the replacement of the wooden bridge just west of Route 28.